Yorkville, New York— Designed like a magical array of icicles frozen in time. The new Arendelle Chandelier from 2nd Ave Lighting features 270 Clear Glass Cylinders at various heights in a stunning configuration. The stunning Arendelle lighting fixture (201572) features a striking array of glass cylinders. The square frame and hardware are featured in a bold Solar Black finish. 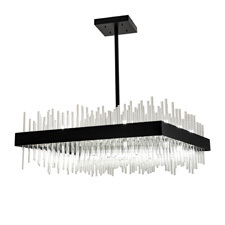 All are handcrafted in 2nd Ave Lighting’s 180,000 square foot manufacturing facility in Yorkville, New York. The chandelier is 48 inches square and has a total height of 50 inches. Custom options include special sizes and finishes. The chandelier is UL and cUL listed for damp and dry locations. 2nd Ave Lighting features a signature brand and style that captures a stunning, personalized look that can be specified by design, size, finish, material and dimmable energy efficient options. American craftsmanship is perfected over years of time-honored artistry, passed down from generations of master artisans. Custom decorative lighting is infused with passion, innovation, luxury and performance.